An area designed for practising a particular sport, normally designated with appropriate markings. Tag leisure=pitch is used for a pitch, an area designed for practising a particular sport, normally designated with appropriate markings. 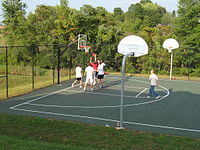 Examples include: tennis court, basketball court, ball park, riding arena. Pitches may be contained within a larger landuse=recreation_ground, leisure=park, leisure=sports_centre, leisure=horse_riding or specific sports field (see the discussion/talk page for discussion on how to tag a larger sports field). A facility with seating for large numbers of spectators should be tagged with leisure=stadium retaining leisure=pitch for the playing surface itself. A golf course should be tagged as leisure=golf_course rather than as a pitch. If there is some physical outline of the pitch or painted line markings, draw an area around it and add leisure=pitch and proper sport=* tag. If a pitch has no clear landcover outline, draw a node in its middle or a way between pitch endpoints (eg. soccer goals or basketball hoops set on bigger grass or sand, etc. area), then add leisure=pitch and proper sport=* tag. leisure=sports_centre - A sports centre is a distinct facility where sports take place within an enclosed area. leisure=horse_riding - Equestrian facility covering a larger area, which may include riding arenas (as pitches) as well as riding halls. leisure=recreation_ground ‒ Use landuse=recreation_ground instead, unless this is a sport pitch to tag with leisure=pitch + sport=*.